MAJOR PRICE REDUCTION. 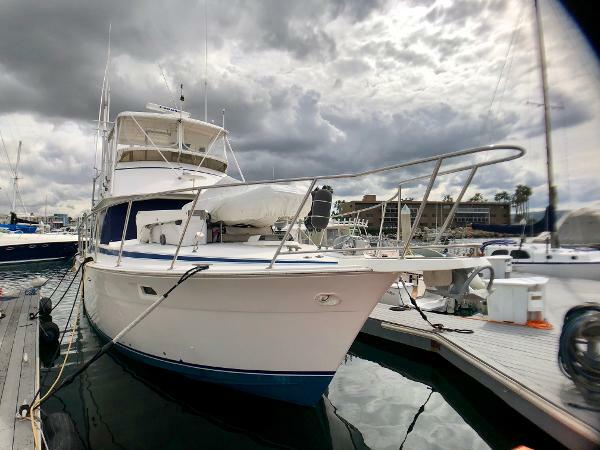 42' BERTRAM SPORTFISHER 1976. Classic lines. Enclosed flybridge. Includes NEWER 2016 dinghy, outboard and davit on bow. Well equipped with Furuno electronics including chart plotter and radar with wireless remotes, EPIRB, SPOT personal locator, built-in VHF, handheld GPS and handheld VHF at flybridge. Lewmar windlass with helm control. 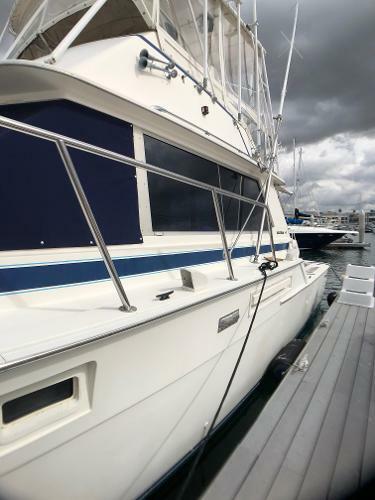 Equipped to fish with bait tank, abundant rod storage, cockpit sink, swim step & ladder. Outriggers. Tackle storage. Magma grill to enjoy your catch! Accommodations include convertible sofa, salon chairs, TV & DVD. MANUFACTURER DESCRIPTION: For all its tranquil lines and sensuous styling, the Bertram 42 Convertible is one hardworking, practical boat. It handles tough weather like a seasoned pro. Bertram's high-tech engineering and tough construction give this 42-footer all the strength and durability one could ask for without slowing her down. She has a cruising range of almost 400 miles and a top speed of 25 miles an hour, which makes for refreshing rides up top or comfortable cruising below. Beautiful lush fabrics and teak veneer accent luxury features, which include a giant salon with a convertible lounge. The galley offers a myriad of space and can be equipped to create anything from simple sandwiches to gourmet meals. A full-size refrigerator and a range with an oven are only a few standard necessities. What passengers don't notice right away is all the additional space. There is a pantry that's more than handy, an above-counter sliding locker for additional storage, even a hidden storage opening through a countertop hatch. Continuing below is a master stateroom that's high, wide and handsome, with a large bed and a private head with a stall shower. The forward cabin, too, makes imaginative use of space, with two extra-large berths and an adjoining head with a shower.